India is considering the possibility of leasing a Russia-made Akula II-class submarine, according to serving officer in the Indian Navy Cmdr. Abhijit Singh. India will discuss leasing Russia-made submarines at the meeting of the India-Russia Intergovernmental Commission for Military-Technical Cooperation (IRIGC-MTC) on November 2, serving officer in the Indian Navy Cmdr. Abhijit Singh told Sputnik on Saturday. On Friday, India’s Defense Minister Manohar Parrikar arrived in Moscow to discuss military and technical cooperation within the framework of IRIGC-MTC. “There will be discussions for the leasing of an Akula II-class submarine. This has been under consideration for some time,” Singh said. In 2010, India began a 10-year lease of the nuclear-powered attack Akula-class submarine Nerpa. 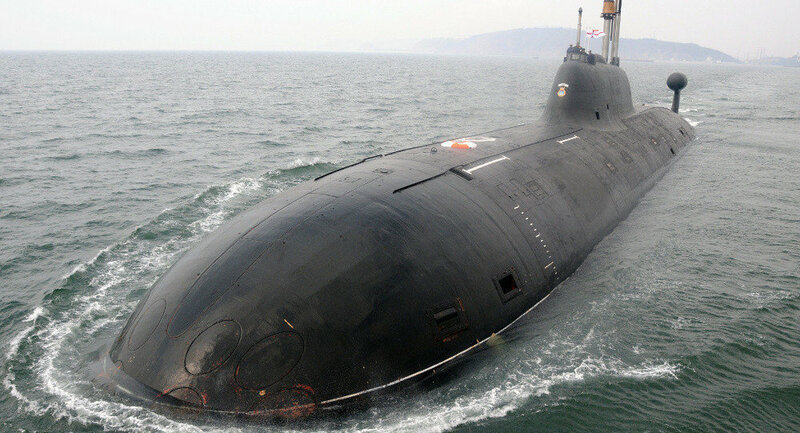 After joining India’s Navy, the submarine was renamed to INS Chakra.India and Russia have enjoyed good relations since the 1960s, underpinned by Russia’s position as New Delhi’s foremost military supplier, particularly in the post-Cold War era. IRIGC-MTC was established in 2000 to enhance bilateral cooperation in the military sphere. It is co-chaired by Parrikar and his Russian counterpart Sergei Shoigu. NEW DELHI, October 26. /TASS/. An agreement on leasing another Russian nuclear-powered submarine to India is to be signed at the Russian-Indian summit in December, a source at India’s Defense Ministry told TASS. The possibility of leasing a second submarine from Russia will be studied when India’s Defense Minister Manohar Parrikar will visit Moscow next week,” the source said. “Parrikar will hold talks on this strategic project with his Russian counterpart Sergey Shoigu. After the ten-year contract is signed another two or three years will be required for upgrading the submarine in keeping with India’s requirements,” he said. Over the past 45 years Russia and India have established reliable, time-tested strategic ties in the field of defence. India’s armed forces are equipped with Soviet and Russian military hardware 70%, the source said, adding that Russia had always provided its best military hardware to India. A Russian military source at the Russian embassy in New Delhi has confirmed to TASS the negotiations on leasing the Kashalot K-322 nuclear power submarine of project 971 Shchuka had entered the final phase. 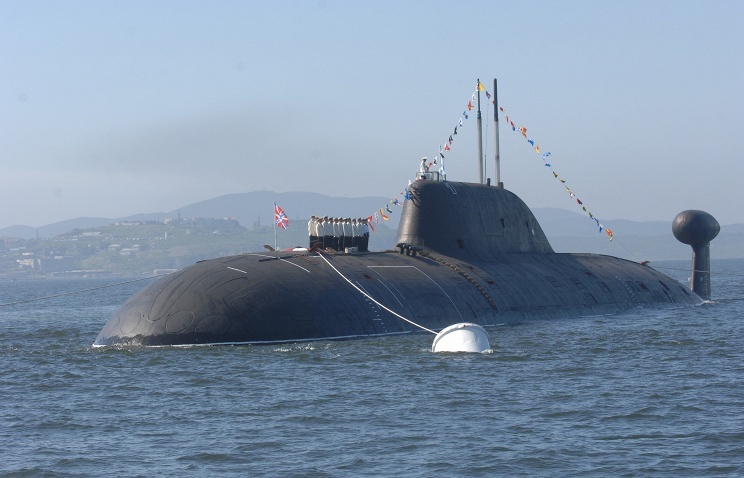 According to the Russian source, the submarine will undergo fundamental upgrade in line with the customer’s requirements at the Amur shipyards, where it is at the moment. The repair, upgrade and testing work and the Indian crew’s training are to be completed by 2018. Varshavyanka-class diesel-electric submarines feature advanced stealth technology, extended combat range and the ability to strike at land, surface and underwater targets. They have been dubbed “black holes in the ocean” by the US Navy because they are virtually undetectable when submerged. A new Russian Varshavyanka-class Novorossiysk submarine will hold a four-day military exercise in the Black Sea, a source in Russia’s Southern Military District told RIA Novosti on Thursday.On Wednesday, Novorossiysk, the first new Russian Black Sea Fleet submarine in the post-Soviet Russian history, passed the Turkish Straits and arrived to its permanent deployment in the Black Sea. “The navigation in the Black Sea is completely different. Besides, the Black Sea basin has peculiarities associated with hydrogen’s occurrence,” the source said, adding that one of the drills involves the submarine crew’s adaptation to their new environment. According to the source, the crew of the submarine will practice tracking underwater ships at various distances. 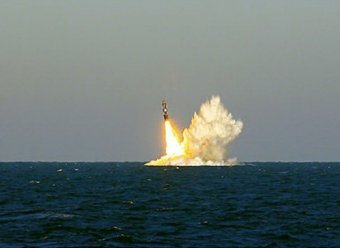 “After completing the training missions the submarine will arrive in Novorossiysk — its stationing site — on September 21,” the source pointed out.Varshavyanka-class diesel-electric submarines feature advanced stealth technology, extended combat range and the ability to strike at land, surface and underwater targets. They have been dubbed “black holes in the ocean” by the US Navy because they are virtually undetectable when submerged. In July, Navy Commander Adm. Viktor Chirkov said that Russia will add six diesel-electric submarines to its Black Sea Fleet by the end of 2016. 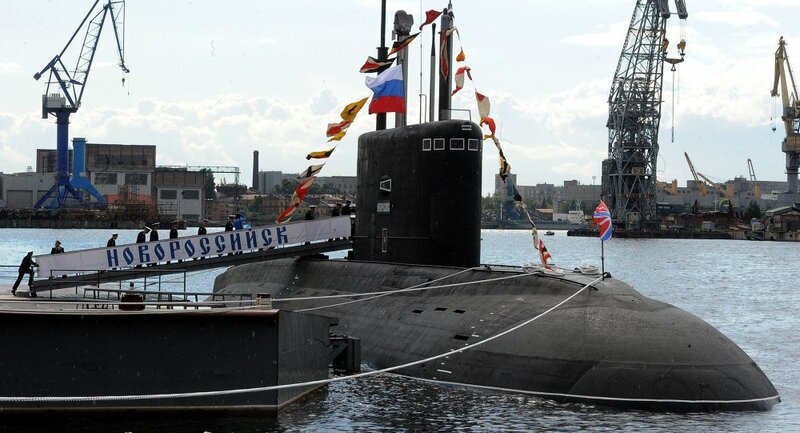 One more submarine besides Novorossiysk — Rostov-on-Don — is expected to arrive to its place of permanent deployment in December 2015. The UK’s Ministry of Defense has finally admitted after five months that a British submarine collided with a fishing trawler on the south-east coast of Northern Ireland – not a Russian one. Back in April 2015, newspaper headlines in Britain screamed with hysteria that a fishing boat had almost sunk to the bottom of the sea after a ‘collision with a Russian submarine’ in the Irish Sea. It was claimed that a Russian submarine had crashed with fishing trawler, Karen, dragging it backwards after its nets became entangled with the submarine, according to a fisherman’s organization. In a dramatic recount of the event, crew members said they scrambled to release the wires connected to the trawler which “had been moving slowly forward but was suddenly sent careering backwards through the water”. The vessel returned to Ardglass where the scene was described as a “B***** mess” amid claims that “something like this would never happen involving a British submarine due to Royal Navy protocols”. And the ill-mannered submarine didn’t go unnoticed in the local fishing community. Sinn Fein Northern Ireland Assembly member Chris Hazzard said the community was angry. Vietnam on Saturday celebrated the replenishment of its navy with two additional kilo-class submarines, which were produced in Russia. At the commissioning ceremony at Cam Ranh Naval Base in Khanh Hoa Province, south of Hanoi, the national flag was raised on both vessels.During his official speech, Rear Admiral Pham Hoai Nam, the Vietnam People’s Navy commander, said the submarines will signify a new stage in upgrading the navy and the fighting capabilities of the Vietnam People’s Army. The submarines’ names — 184-Hai Phong and 185-Khanh Hoa — were originally the names of Vietnamese coastal cities. There will be two more 636 Varshavyanka Kilo-class submarines arriving in Vietnam to complete the 6-item deal. The diesel-powered vessels were ordered in 2009 from Admiralty Shipyard in St. Petersburg for $2 billion. The first two submarines, the 182-Hanoi and 183-Ho Chi Minh, were handed over to Vietnam a year ago, in April. The last delivery is scheduled to be carried out by 2016. Russia will also train Vietnamese crews and provide indispensable spare parts. All of the commissioned submarines are to join Submarine Brigade 189, Vietnam’s news agency VNA reported. As the submarines were commissioned amid ongoing tension in the South China Sea; Pham Hoai Nam also stressed during his speech that reinforcement of the Vietnamese navy wasn’t meant to create an arms race or deter other countries, but only to protect country’s sovereignty and ensure peace in the region. The first Russian Kilo Class submarine was released in the early 1980s. The latest models of the vessel are almost 74m-long, have a 3,000-ton displacement and can operate in 300 meter-depths at a speed of 20 nautical miles per hour. Russia could offer to build its latest nuclear submarine, possibly the multi-purpose ‘Yasen’ class sub suitably modified for India, analyst Zachary Keck wrote in an article for The National Interest. A modified ‘Yasen’ class submarine, Russia’s latest nuclear sub, could be built specially for India, a report in the Indian ‘Economic Times’ newspaper suggested. The ET was quoting the analyst Zachary Keck who, in an article in ‘The National Interest,’ said it was possible that the new submarine would be one of the multi-purpose ‘Yasen’ class submarines, equipped with cruise missiles, or a modification of the Yasen. According to Keck, the ET report states, India has been interested in leasing a multi-purpose attack submarine for quite a long while. This time, the Russian government has taken this interest on board and is developing a separate submarine for India. “The final details are yet to be discussed, but at present it has been practically decided that a completely new submarine will be built”, the ET quotes Keck as saying, while citing an anonymous source familiar with details of the project. According to the article’s author, the ‘Yasen’ class submarine, if decided upon, will be a significant addition to India’s reduced submarine fleet. “The Yasen class submarine is one of the most promising in the world. According to information available, the submarine crew comprises 90 people, and is designed to have a high degree of automation. Equipped with a new generation atomic reactor, the submarine can reach a maximum speed of 40 knots and, in silent mode, is capable of 20 knots”, said Kyle Mizokami in an interview with Keck. The Yasen class submarine is equipped with eight vertical missile silos, four 650 mm torpedo tubes and four 533 mm torpedo tubes. The Yasen is also likely to be armed with the high speed underwater ‘Shkval’ torpedo, which has a radius of seven to thirteen km and a speed of up to 200 knots.